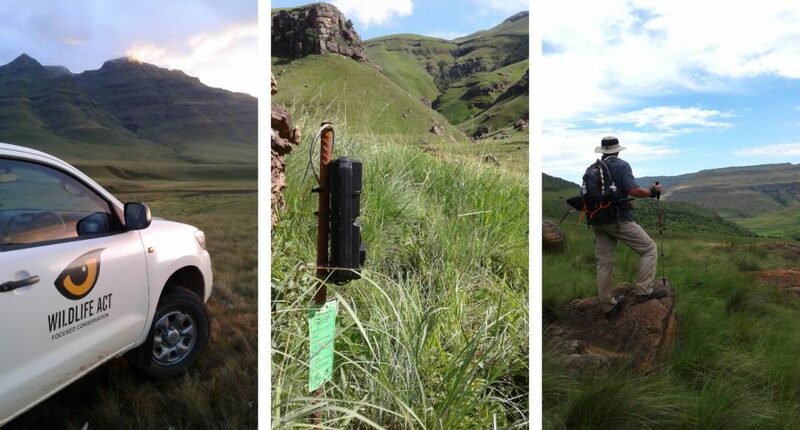 The Drakensberg Leopard Survey (southern uKhahlamba-Drakensberg Park) took place from November 2016 to January 2017, and was the 8th camera-trap survey carried out in KwaZulu-Natal in 2016. These surveys form part of the KwaZulu-Natal Leopard Monitoring Project (KZNLMP) – a partnership between Panthera, Wildlife ACT, Ezemvelo KwaZulu-Natal Wildlife and the iSimangaliso Wetland Park Authority. The KZNLMP (initiated in 2013) collects valuable data that is being used to calculate leopard population trends throughout KZN and also helps to identify current and future threats. This provides conservation authorities with essential information to inform and evaluate leopard conservation practices. Most of the uKhahlamba Park can be difficult to access. It is rugged, mountainous and vast – with only a few access roads near the edges of the park. This resulted in the majority of the Drakensberg leopard survey being carried out on foot. Due to the assumption that this area supports low leopard densities, the survey design was altered slightly to the other areas in KZN by increasing distances between sites from 2km to 3.5km. This resulted in 40 paired camera trap stations – covering an estimated area of about 400km2.. More than 700kms were walked during the setup, camera checks and take down. Drakensberg Leopard Survey layout – 40 paired stations, across 400km2. 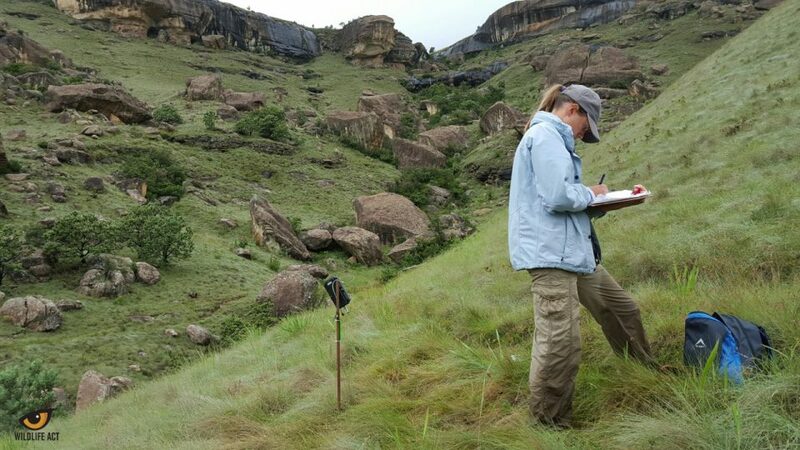 The survey area that was covered started in the southern section of Cobham stretching up to Lotheni. It included most of Cobham, Vergelegen, Duart Castle and Lotheni Nature Reserve. For practical and logistical reasons it excluded most of the Sani Valley and the Khanti area. The survey period ran from 11 November 2016 to 10 January 2017 – resulting in 71 days in total including set up and take down. Images showing landscape, terrain and habitat. Unfortunately no leopard images were captured during the survey. This does not necessarily mean that there are no leopards present – possible leopard scats were collected and have been sent to UCT for genetic analysis – but rather indicates a very low leopard density. 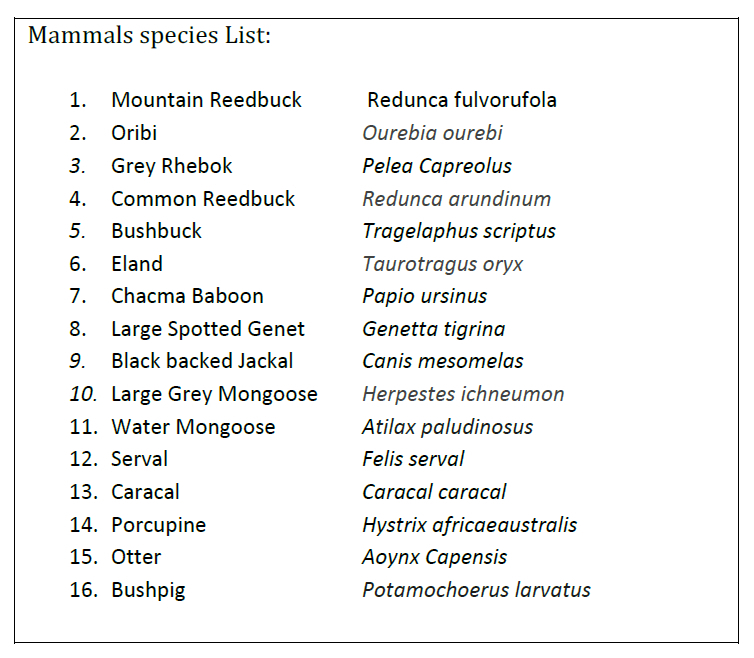 There was however an apparently healthy population of other species across the entire survey area (see species list below). The data will be processed using Panthera’s online citizen science platform Camera Catalogue and the full dataset will be made available once all photos have been classified. The survey protocol used by the KZNLMP was designed for savanna regions with a relatively high leopard density. 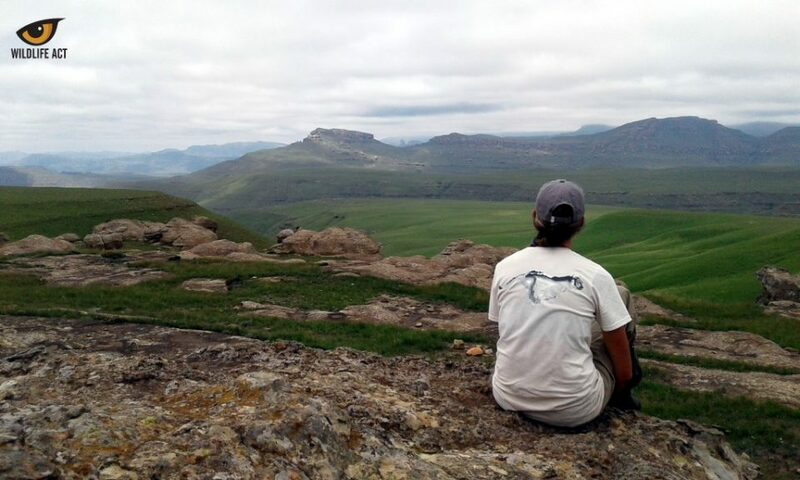 While we made adjustments in an attempt to account for the unexpectedly low leopard densities in the Drakensberg, these may not have been sufficient. Leopard population surveys in mountainous regions elsewhere in South Africa typically survey an area for three to four months. 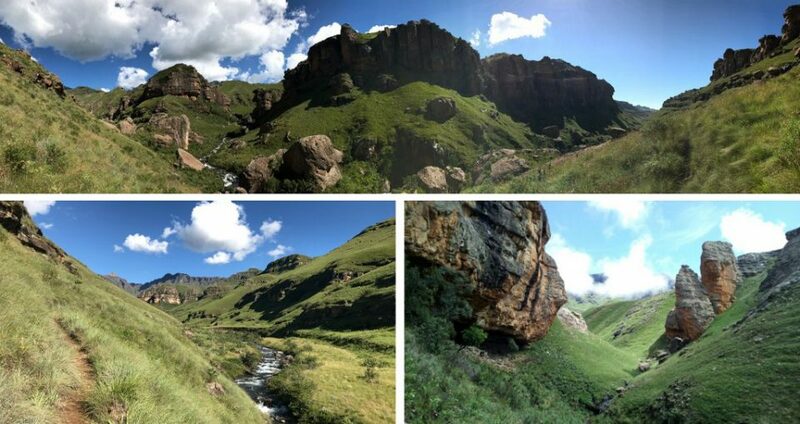 Unfortunately due to a busy survey schedule, a survey of this length was not possible in the Drakensberg. It was also not logistically feasible to run a pilot survey to help to identify sites used by leopards prior to initiating this survey. The cameras were setup in various habitat types – valley bottoms, thick wooded patches, and open grasslands. Nevertheless, the complete absence of leopards is concerning. In total the survey effort was 2 334 days – substantially higher than the average survey effort in KZN of 1 692 days*. While this may not have been a sufficient period to obtain enough leopard pictures to generate a population density estimate, we would have expected to obtain some leopard pictures. Camera trap surveys in the mountainous regions of the Western Cape where leopard densities are similarly low (1 leopard per 100km2) have typically recorded at least 1 photo per 100 days of camera trapping. 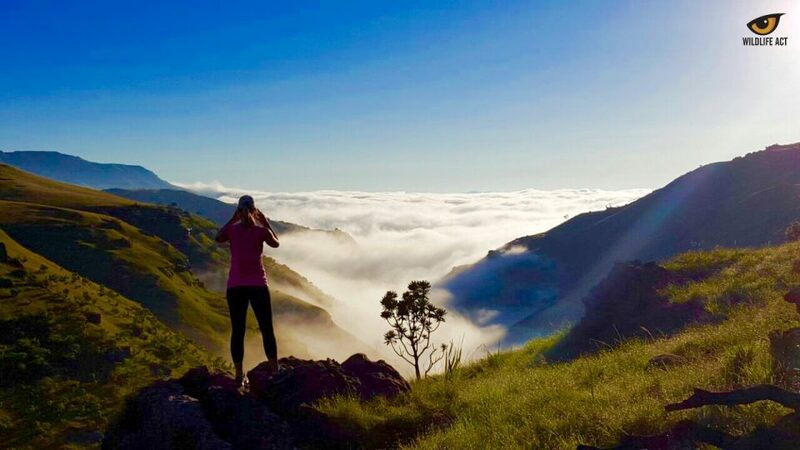 The results of this Drakensberg leopard survey suggest that, while leopards may persist in the Drakensberg, their numbers are possibly too low to constitute a functioning population. 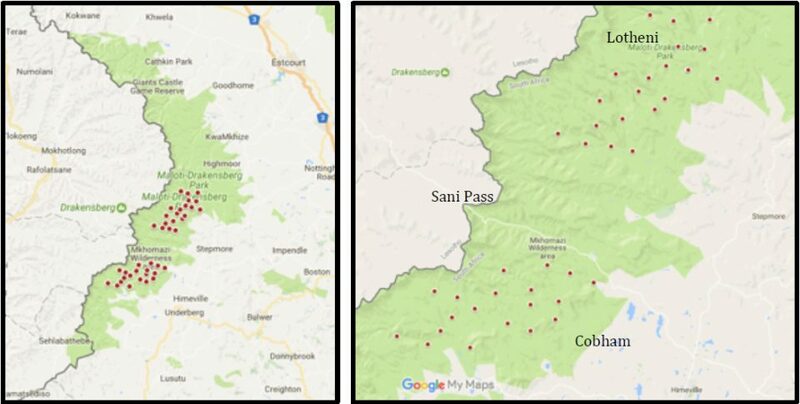 While monitoring leopard populations in mountainous areas is difficult and time-consuming, these are important refugia and habitat links in the context of the broader South African leopard population. We recommend further research to establish whether leopards are still extant in the southern Drakensberg, as well as to identify possible management interventions that could allow for population recovery. Ezemvelo KZN Wildlife – facilitation and logistical support from John Crowson and his staff. Spurgeon Flemmington, Terence Letley, Paul Roth and Natasha Avni for guiding and helping with the setup, checks and take down of all the cameras. Wildlife ACT field staff – Thandi Knutson and Richard Steyn for the long hours and technical support during the survey. Underberg Superspar (Cathy and Sam Knox) for graciously sponsoring all the food for the survey. Underberg Forge for sponsoring the metal stakes the cameras were attached to. Out There Services (Luke Wood) for all the hours of welding loops onto the metal stakes. Humphry Hamilton for access through his property during the early hours of many mornings. MANN GKH 2014. Aspects of the ecology of leopards (Panthera pardus) in the Little Karoo, South Africa. PhD thesis, Rhodes University. MARTINS QE 2010. The ecology of the leopard (Panthera pardus) in the Cederberg Mountains. PhD thesis, University of Bristol. SWANEPOL LH, LINDSEY P, SOMERS MJ, VAN HOVEN W & DALERUM F. 2013. Extent and fragmentation of suitable leopard habitat in South Africa. Animal Conservation 16 41-50.